Believers, we learned yesterday that in Christ we are the seed of Abraham, and since Jacob (later renamed Israel by God) was the seed of Abraham ( he was Abraham’s grandson) then in this verse we could insert our names also. 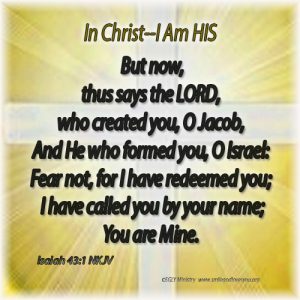 The LORD created us, formed us, redeemed us, called us and we belong to Him! So don’t ever let yourself feel you don’t belong, for in Christ you are the seed of Abraham, a child of God, you belong to the LORD, Creator of the Universe, King of Heaven and Earth, and Almighty God. He is your Abba Father! What a blessing it is to be in Christ!